Low Carbon Brazil spoke with PISCIS doctor and biologist Julio Ximenes and with Anton Rossbach, CEO at German company GLOASIS GmbH. Together in a project that will benefit much of the state of Ceará regarding food production and job creation. 1. Piscis has been operating in the Castanhão/Jaguaribara region since 2009. Tell us about Piscis and about the situation in the region since 2009 until today regarding fish production. Julio Ximenes: PISCIS began its activities in 2009, still very incipient, working on the production of oil from tilapia viscera. At this time, the company had a very small production, however, from that year, the production of tilapia in the Castanhão dam was intensified annually, as well as the production of PISCIS oil. Over these years, production intensified, but since 2017 growers began to experience water shortage and the volume of tilapia produced declined dramatically. 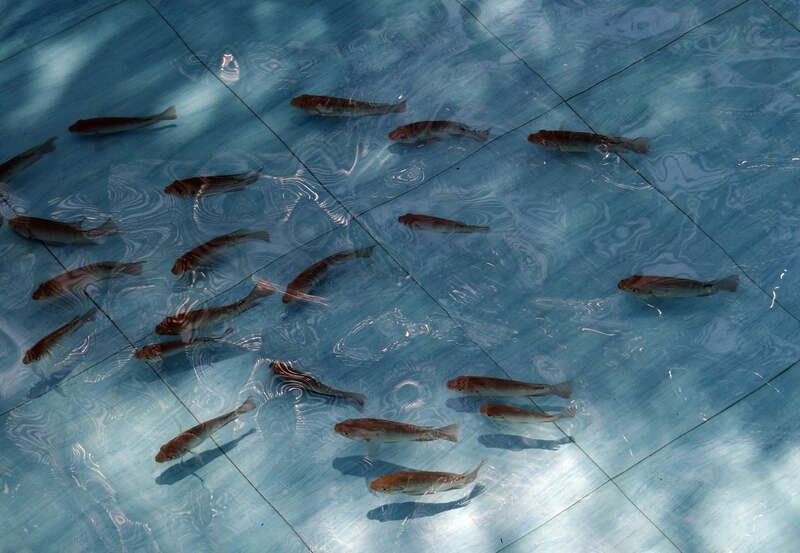 In addition, in 2016, 2017 and again in 2019 there were water quality setbacks in Castanhão that led to the mortality of an additional 100 tons of fish in each of these setbacks. Currently, production is practically finished in Castanhão, as it presents less than 5% of its water capacity and already operates practically within the dead storage level of the dam. 2. In 2012 you identified a solution for the volume of waste derived from fish viscera. But the needs are different nowadays. Could you explain what the region needs today? Julio Ximenes: As of 2009, the company already had a solution for viscera residues, but as of 2012, with the intensification of production, the company had to adapt. This year, the company relocated its headquarters from Jaguaribara downtown area to the rural area, where it would have more room to work. In addition, it approved its first research project, in which it adapted a truck with a viscera-sucking system. Those measures were taken so that the company would be able to meet more efficiently the demands of the producers who needed to get rid of the viscera coming from fish processing. Currently, the region needs to resume fish production, as it is worth mentioning that in these 10 years of intensive production, the city of Jaguaribara has adapted to fish production, for which several companies of ration and commerce with products directed to the production were installed, in addition to the work labour that specialized in tilapia production. However, this production must be more sustainable and less dependent on water, and it is necessary to work with the reuse or recirculation of such water, in which it is possible to perform production, treat the water and return it to production without losses. 3. As a result of the current situation of the Castanhão dam, you have looked for foreign companies such as the European Gloasis. What caught your eye about Gloasis during the business rounds promoted by Low Carbon Brazil regarding the development of the tilapia and shrimp production project in a sustainable system with renewable energy sources? Julio Ximenes: The company Gloasis has an innovative proposal to integrate the production of tilapia, shrimp and aquaponics into a sustainable environmental and economic system, and especially for our region, which uses, recirculates and renews water without losing it. This characteristic is essential for our region, since it has been suffering from the drought for 6 years. 4. And what can we expect from the project in partnership with Gloasis? Is desalination something to be taken into consideration? Julio Ximenes: The proposed project is not exclusively a desalination plant. 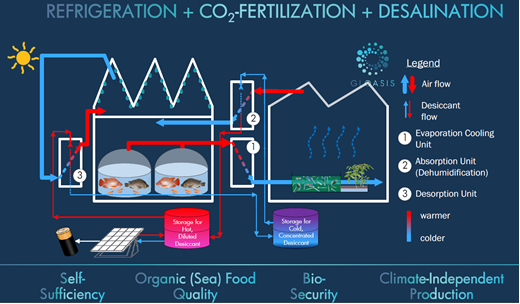 In fact, the desalination process is an important part of the project, but the main objective is to integrate the production of tilapia, shrimp and vegetables (through aquaponics) into a circular economy concept, in which tilapia production residues (waste), one part of it is reused in aquaponics (vegetable production) and the other part is used in the formation of flakes to produce shrimp and used to reduce expenses with feed. In addition, the process of water evaporation (completely normal process in an aquaculture production) is used to cool the vegetables and is subsequently condensed, characterizing the desalination, in which this water can be reused for tilapia production. 5. Tell us about Gloasis and how long it has been working on the aquatic farms segment offering solutions for production, desalination and power generation. Anton Rossbach: Gloasis GmbH was founded in 2016 to explore research and development expertise at the Technical University of Berlin in the field of desert greenhouses with focus on commerce and renewable energy. Our main goal is producing fresh water, food and energy in a sustainable and profitable way. 6. Desalination is one of the steps within the fish and shrimp production process. What makes the Gloasis plant and methodology different from the others? Tell us a little more about the process and the economy generated. Anton Rossbach: Our plants are not really comparable to conventional desalination plants. Consider the greenhouse effect module, for example: A greenhouse needs about 8 litres of water per m³ per day, three of these are assimilated by plants along with CO² using solar energy and converted into glucose/biomass, which we all know as photosynthesis. However, five litres of irrigation water are evaporated by the plants to cool. This is equivalent to 50 m³ per hectare of greenhouse surface with such plants. Typically, those 50 m³ per hectare + evaporative cooling by machines are vented out the windows to release the heat and get dry air to allow the plants to continue to perspire/evaporate more water into the air for cooling. In our process, we do not only recover the evaporated water, but also greatly accelerate the growth of plants by CO² fertilization with the CO² produced by the animals. In the fish and shrimp modules, on the other hand, we have the following situation: Fish live in their water and consume oxygen from their environment. When we produce them in low densities, such as in a natural lake, this is no problem. Here, enough oxygen naturally recharges from the air through the surface of the water. However, when we grow animals intensively, which means in high density, such as in shoal of fish, we need extra aeration. This is an energy intensive process because one has to pump air or pure oxygen into the water or to pump the water into the air as in a cascade to saturate it with oxygen. The second option is less energy intensive, but it comes with a high rate of evaporation. Therefore, this option is generally not applied in cold regions such as my Germany because it cools the water and leads to a demand on the heating of the aquariums. This may exceed the electricity savings compared to the "pumping air to water" option. In hot regions, this water aeration energy saving method can be applied, if the water to be evaporated is abundant or if the evaporated water may be recovered. The evaporative cooling energy produced may even be an advantage, when water needs to be cooled, or when there is a further production process to be cooled, such as solar energy production or greenhouse horticulture. At Gloasis, the same facilities that provide large parts of the aeration for the fish also provide cooling energy for the greenhouses. Thus, we may use the most efficient aeration energy and even use it as a subsidy for the fan cooling pads. 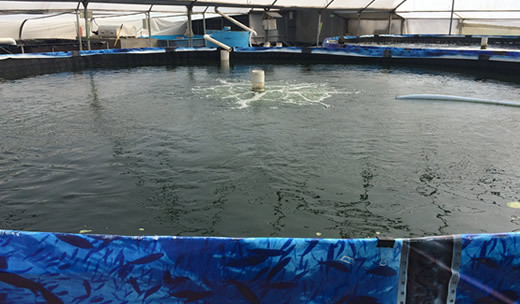 This saves installation and operation costs compared to producing solitary aquaculture or solitary horticulture. 7. Talking about the energy used to run the entire process generated. Is this solution totally disconnected from the power distribution grid (off-grid)? Anton Rossbach: Our water farm plants are perfectly suited for Co-Siting with solar energy projects, because we can even increase their efficiency by providing cooling power. The positive effect is that the more cooling energy we have to provide, the more energy from evaporative cooling (water) we have to produce, and the more water we can desalinate when we apply aquaculture to seawater. Thus, the plant may be designed completely disconnected. However, farmers who want to install one of our plants may also consider producing the energy for the grid, by means of the polyculture of fish and vegetables. In addition, they naturally benefit from the independent production of climate due to water and air conditioning inside the factory. 8. How long do you estimate it will take the project and the plant in partnership with Piscis to get into operation? Anton Rossbach: The project has progressed successively since our first meeting in the initial phase during the business round organized by Low Carbon Brazil and we are adapting the production processes to the requirements of the Brazilian market. The Northeast is very rich in sun, and the Brazilian people like to eat fish, much more than the Europeans. This ends up changing a lot of the production process and time, because we cultivate living things and we want to and we have to offer the best and healthiest growth conditions at every stage of their lives. When project funding is assured, it will take about 9 months for the buildings and then a few more months before we can harvest the first plants and catch the first shrimp and fish. 9. How will the results of the plant be measured in terms of employment, economy, power generation and clean water produced in the region? Anton Rossbach: At this point it should be mentioned that, today, agriculture is the largest consumer of water in the world with 70%. Gloasis offers a solution for water-producing agriculture. The demonstration plant will create 36 long-term jobs on the farm, from management to farming, through packaging and security. The amortization period is about four years. Electricity will be produced by photovoltaic panels during the day and, at night, when grid electricity costs essentially less, to save investment costs of batteries. 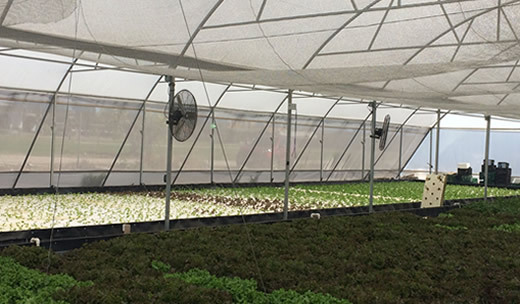 We will save even more energy in aquaculture and horticulture by using the evaporative cooling of greenhouses also for parts of the intensive aeration energy of fish tanks. The demonstration plant has no connection to the sea. We will recirculate the water from fish tanks after treatment and use it for greenhouse irrigation, as well as recycle the evaporated water. Thus, we will use 80% to 90% less water than conventional greenhouse horticulture, using aquaculture recirculation.